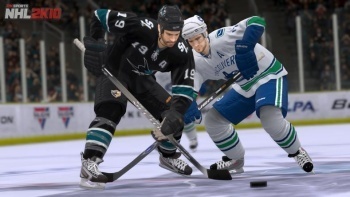 2010 Winter Olympics hero Ryan Kesler has been chosen as the cover athlete for the upcoming NHL 2K11, prompting gamers and hockey fans across Canada to say, "Wait, what?" Did you happen to catch the Olympics? If so, you might have noticed that the U.S. Olympic men's hockey team didn't win gold. It took home the silver medal instead, which is certainly respectable but, when get you right down to it, still just the prize they give to the losers. Nonetheless, 2K Sports today announced Kesler as the NHL 2K11 cover athlete, saying he "captured the collective attention of sports fans around the world with his gritty and awe-inspiring performance" as a leading member of the U.S. Olympic men's team. "Ryan is one of the most talented and exciting players to watch in the NHL today and his popularity has grown exponentially since the recent success of Team USA at the Winter Olympics," said 2K Sports Senior Vice President Greg Thomas, who apparently defines "success" as "not losing as badly as, say, Latvia." "Having the opportunity to participate in the Olympics and play in front of my home crowd was one of the best experiences of my life," added Kesler, who plays for the Vancouver Canucks. And while he made the usual press release noises about being excited to work with 2K Sports and NHL 2K11 being a great game, he was a bit more subdued and candid in comments to Kotaku. "I was pretty disheartened after we lost in the gold medal game, and to get the call the next day and to be asked if I wanted to be on the cover, it was a nice pick-me-up," Kesler said. "It's always been a dream." He said the team's effort in capturing silver - which, all kidding aside, was pretty damn awesome - made a big impression on hockey fans in his home country. "Our first game back was in Columbus, the second was in my hometown of Detroit, and I was definitely getting more cheers there than before," he added. "The biggest thing I've noticed is being stopped in the street, people congratulating me, congratulating us all." And while the U.S. didn't go home with hockey gold, Kesler's sense of humor is still in one piece. When asked what he thought of Canadians would feel about the choice of a U.S. player for the cover instead of one of their own, he laughed. "I'm not saying sorry," he said. "They got us when it counted, they have nothing to complain about."